To their surprise, more than 85 percent of all visible light was harvested by the photoelectrode, which was far more efficient than previous methods. Gold nanoparticles are known to exhibit a phenomenon called localized plasmon resonance which absorbs a certain wavelength of light. 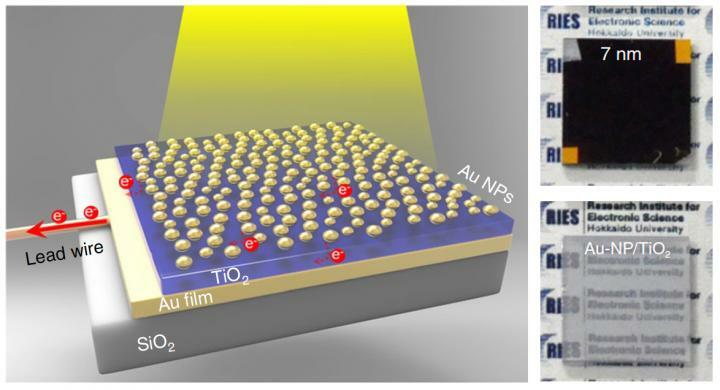 "Our photoelectrode successfully created a new condition in which plasmon and visible light trapped in the titanium oxide layer strongly interact, allowing light with a broad range of wavelengths to be absorbed by gold nanoparticles," says Hiroaki Misawa. When gold nanoparticles absorb light, the additional energy triggers electron excitation in the gold, which transfers electrons to the semiconductor. "The light energy conversion efficiency is 11 times higher than those without light-trapping functions," Misawa explained. The boosted efficiency also led to an enhanced water splitting: the electrons reduced hydrogen ions to hydrogen, while the remaining electron holes oxidized water to produce oxygen — a promising process to yield clean energy. "Using very small amounts of material, this photoelectrode enables an efficient conversion of sunlight into renewable energy, further contributing to the realization of a sustainable society," the researchers concluded.